The Rissingtons are a group of villages just outside Bourton-on-the-Water. 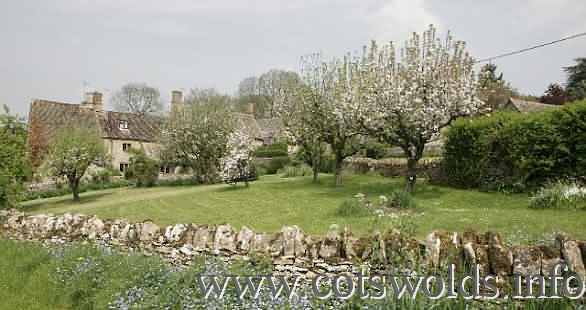 Wyck Rissington and Great Rissington are two delightful villages to visit, having a great deal of character and some amazing views across the Cotswold countryside. The churches are outstanding and the stone cottages in both villages range from the 1400's right up to present time. It is almost like taking a stroll through history. Little Rissington, once the home of the Red Arrows at R.A.F Little Rissington, has a 12th century church called St. Peter's containing a memorial window to those that served at the R.A.F base. In the churchyard itself there is another memorial surrounded by the gravestones of the men that died serving their country. As you can see from the pictures below this church should not be missed during your visit to the Cotswolds. As would be expected the villages have shops, restaurants, and places for accommodation and lodgings, both in and nearby including Hotels, B&B, Self-Catering Cottages, Inns and Pubs. The Brumpton family including 3 black labs, 4 horses, 2 ponies and a variety of chickens invite you to Home Farm Holiday Cottages.New for 2010 we have 3 traditional Cotswold Stone cottages available as holiday lets. Home Farm holiday cottages lie in the heart of the North Cotswolds in the village of Little Rissington. Situated a 10 minute walk from Bourton on the Water, the “Venice of the Cotswolds”, and a 10 minute drive from the market town of Stow on the Wold. On arrival we will make sure you have everything you need to get you started including tea, coffee, milk, bread and butter and depending on how busy we have been in the kitchen, you may also find some home made biscuits and jam. All cottages have access to our hard tennis court and games room (pool table and table tennis).